SEATTLE — An endangered orca is still clinging to her dead calf more than two weeks after her newborn died. Michael Milstein, a spokesman with NOAA Fisheries, says researchers on Wednesday spotted the 20-year-old whale known as J35 carrying her dead young off the tip of Washington's Olympic Peninsula. The calf died July 24 and the image of the mother whale clinging to the dead calf has struck an emotional chord worldwide. Milstein says researchers with Fisheries and Ocean Canada also spotted another member of the same pod — the 3 ½-year old whale J50 that is emaciated. 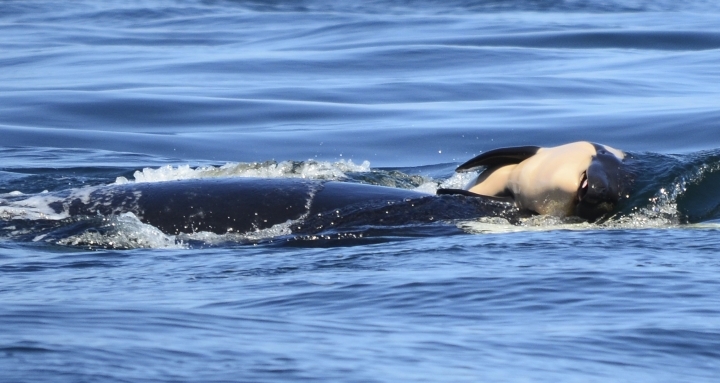 The ailing orca was swimming with her mom Wednesday. A team of experts led by NOAA Fisheries have been searching for the young whale to assess her health and potentially give her medication.